The dragonflies fly all over the place! Be ready for take-off! Here is the Zygos wall sticker for a mind-blowing deco! Put your fins and snorkel on! The little fishes are waiting for you! In the bathroom, you won't be the only one to take a dip! 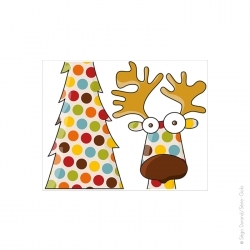 The funny Bubbles sticker is a splash of colors on your wall! Here is a cute little family of winkles! One on top of the other, they do whatever they want, making lots of somersaults. 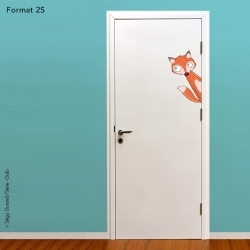 The Serie-Golo wall stickers for children are a full range of stickers for all tastes! Glug glug glup! The favorite game of this little fish is to make thousands of bubbles! The Bubble-Fish wall sticker can be for anywhere you want to customize your deco. Waouh! Love is in the air for these cute caterpillars. 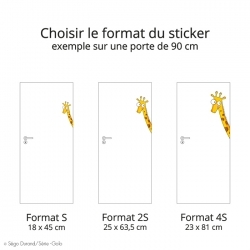 A small sticker with a lot of fun to brighten you interior. 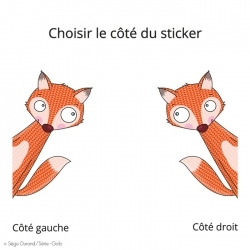 Série-Golo, a wide range of wall stickers for children! Sing little bird, sing! You make me happy! 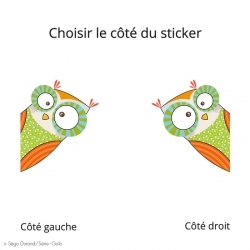 the stcker "tweet tweet" to use alone or as in addition to a larger sticker for a custom deco. The little fishes under the water are all so beautiful! In the bedroom, they guarantee a soft ambiance for you to swim towards your sweetest dreams! The Little fishes 2 sticker will fulfill all your deco desires! Snails are funny! They are climbing the walls of your bedroom. Did you see that? One snail is hiding underneath his shell! Just like me when I hide underneath the sheets! 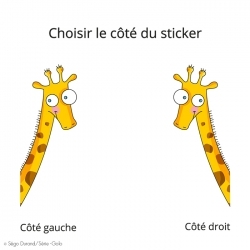 That's the Pretty Snails sticker for all children ! Flying is easy! A beat of the wings and off we go! Here is a pink bird and a green bird that fly all over the walls! The Birds 2 sticker is a light and colorful decoration to stick anywhere in the house! Hey! This little bird seems to be very much in love! This is a beautiful little touch of poetry on the walls! With the Love Orange sticker decoration, love is in the air! Let's make it turn and spin in all directions! One is yellow, one is pink and the other is blue! Here are 3 butterflies who fly in the sky and on the walls of your little one's bedroom! With the Butterflies 1 sticker, my dreams are taking off! 9 multicolored butterflies to stick wherever you want in the house. All with different patterns, they will give colors to your home deco. Look! 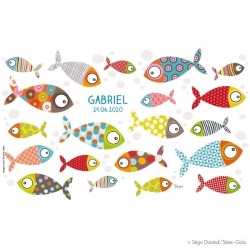 punky fishes to complete our sea collection of stickers! With their rock n' roll look, these fishes will bring colors to your walls. 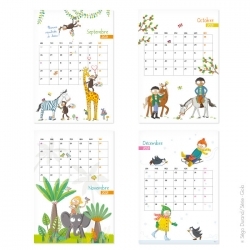 It's spring all year in your home with the sticker " bird's song". 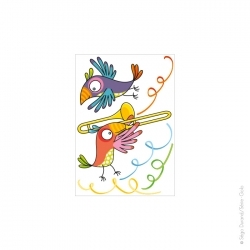 The little birds are so cute with all their colors, a sticker for a colorful daily life. Once upon a time…a little ship was sailing quietly under a soft wind. Here is a little boat with his cool roommates (the hedgehog, thefrog and the ladybug) sailing off for adventurous trips. The Little ship wall sticker brings a sea-fresh breeze to the deco of your bedroom! Let's go the sea! Actually, we are already there with the The lighthouse wall sticker. It's as if we can feel the sea breeze on our cheeks! 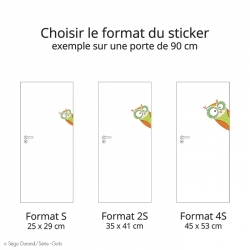 Here is a sticker that can fit anywhere in the house. Here are super nice dickybirds! They are so chatty, repeating everything you say all the time! They are having so much fun! 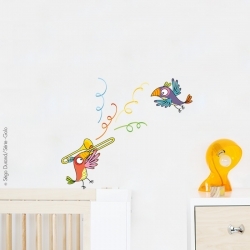 With The Parrots child wall sticker, even your walls will talk!! All the little fishes in the water are beautiful! It guarantees a smooth ambiance in the bedroom that will make you swim towards your sweetest dreams! The Fish 1 sticker will fulfill all your deco wishes! Here is a snail properly installed on the mushroom's back, ready for the show! All these stars are so beautiful! The Small mushrooms wall sticker is a magical deco for anywhere in the house! It's raining, it's raining! That's the duck fiesta! Whoohoo, Let's put on the rain boots, open the umbrella and jump in the puddles laughing! With these Pretty rain drops, the Plic-ploc sticker decorates your walls with a good mood. With his girlfriend the ladybug, puggy is having a lot of fun ! 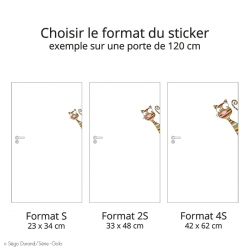 This dog sticker can be used alone or as a complement of other music themed stickers for a custom decoration of your child bedroom. That's so beautiful under the sea! There are little fishes and seaweed of all colors. I land myself be lulled quietly and I swim towards my sweetest dreams! 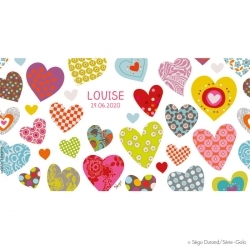 A sticker in the shape of a garland which flies in the air with pretty butterflies. A soft and sweet deco to brighten the room of your baby. Little tip : you can mix it with the sticker Pennant garland 2 to make an even bigger garland! I my room, no need for diving mask or snorkel to see amazing colorful fishes ! 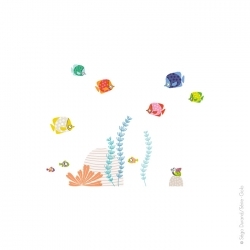 Create you own customized deco with the sticker Tropical fishes and travel through an archipelago of thousands colors. Look at these cute jellyfishes, they'll take you discover what secret lies under the sea! The Jellyfishes wall sticker, to stick wherever you want for a customized deco ! All the little fishes in the water are beautiful! It guarantees a smooth ambiance in the bedroom that will make you swim towards your sweetest dreams ! The Fish 2 sticker will fulfill all your deco wishes! Alert to the little pilots! A greeny duck is approaching in his orange airplane and it's breath taking! The Quack-quack plane sticker flies on the bedroom walls! A deco for little and big ones! Hey! Here is a nice little cloud and a pink butterfly to stick wherever you want in the house! With the Cloud wall sticker, add a little piece of blue sky to your deco! And here is a beautiful sun that makes everyone smile! The Sun sticker can light up the whole house: the lounge, kitchen, living room or bathroom. And why not in the bedroom so you wake up everyday with a bright deco? Look at these lovely damselflies! They are ladybugs, the little queens of woods with their red dotted costumes! Look, there is one hiding in the green grass! Bring a touch of nature in your children's bedroom with the Three ladybugs wall sticker. With the pretty yellow moon in my bedroom, I am so happy to go to bed! She draws the starry sky and it is magical! Blue, pink, green, purple…these stars take me to the land of sweet dreams! Here is the Starlit night wall sticker, made for the sweet nights of our little ones! This doggy dreamer is daydreaming while looking at the butterfly! In the bedroom, it's pure happiness every morning! The doggy's smile says a lot about it! For the cutest deco gand the Dog wall sticker! A lovely dicky bird is in the air! In his colorful hot air balloon, he goes high up in the sky and floats quietly along your walls! 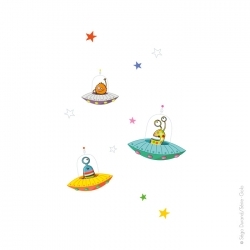 The Tweet-tweet balloon sticker is just happiness in your deco! Who has awoken Mrs The mole? She raised her head a bit surprised! Of course, it's these little pranksters the ladybugs! 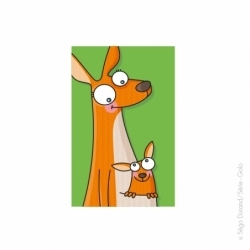 Here is the The mole wall sticker that will make both little ones and big ones smile! A lovely pixie hangs multicolored stars on the wall of my bedroom! That's so beautiful and magical! It changes everything and I can sleep with dreamy eyes full of softness! Here is a pure touch of magic with the Pixie boy wall sticker. My oh my! Mrs The Tortoise almost steps on the hedgehog! Does it hurts?? Anyway, it cracks up the ladybug! The Tortoise wall sticker puts everyone in a good mood! To position as you want to customize your deco! Here are 4 big fishes that are just too cute! Multicolored and with multiples motifs, they hang quietly and chatter with a smile. 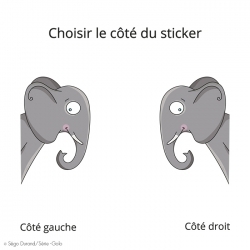 Here is a funny sticker that will bring a good mood to your interior! Hey, Ho...Sailors! Yes they are all together: the rabbits, the birds, the mouse, the frog, the ladybug and the snail, to navigate through the ocean! This 9 little boats wall sticker is to position wherever you like to customize your deco! Samba! This is a Brazilian tune that will make you boogy! These 3 little parrots dance on the rhythm of a rousing music till the end of the night! Fiesta is a multivitamined wall sticker for a dreamy bedroom! Hey! 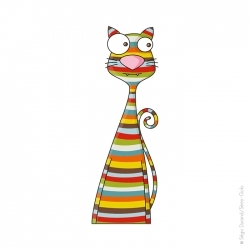 Here are 2 cute kitty accomplices for all kinds of silly things! A small hole in the pillow...that's all we need to start a feather party! 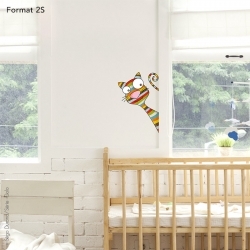 The Kittens wall sticker guarantees a good mood for the little ones and the big ones! Let's go to the sea! Actually, we are already there with the seagulls! They fly around the clouds! It seems that we can hear them and even feel the fresh ocean air on our cheeks! Here is a wall sticker where the clouds and the seagulls can be positioned as you want for a customized deco! Thank you birds for this pretty deco, it give a festive atmosphere to my room, it's great! Little tip : mix it with the sticker pennant garland 1 to get an even bigger garland. Add a touch of exotism to you deco with the sticker flight of the toucans, it will go perfectly with our savannah collection and most of all, with the the sticker toucans that dance on their multicolred lianas. Decorate the bedroom of your children with the sticker " the birds' house". They are so cute these little multicolored birds, they will fly on your wall like magic! Who climbs onto Mum and dad tortoises' back? The tortoise babies! Their shells have plenty of beautiful colors: that's a good mood guaranteed in the bedroom! 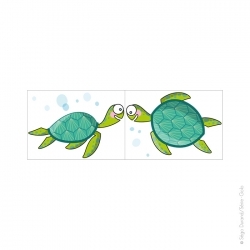 Here is the Tortoise family wall sticker, with little grass stems to stick about as you like. Here there are big round eyes and lovely shells! The snail family is so cute! They hang around quietly with their friends the butterflies. With the Butterflies and snails wall sticker, decorate your kids bedroom as you wish! In my bedroom I never feel alone! There are mummy rabbit and daddy rabbit and their babies! They cuddle and hide in the grass. I love them! The Rabbits wall sticker is for our little rabbit's bedroom! The mice meet up with the ladybugs in my bedroom! What are they talking about? Shhh! It's a secret! 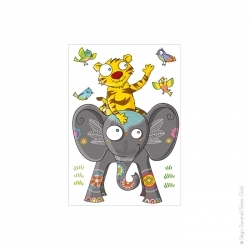 The lovely Mice and Ladybugs sticker is a funny deco for a baby bedroom as well as for kids! With their pretty little noses and their thorns that don't prick you, the hedgehogs are real little pranksters! I like to watch them cuz they crack me up! Bring a little piece of nature into your little ones' bedroom with the The hedgehogs mural sticker. From a lovely tree branch, daddy and mummy bird watch their little ones! They are as warm and cozy in their nest as I am in my bed! The Nest wall sticker is a gentle deco for the bedroom of your little ones! 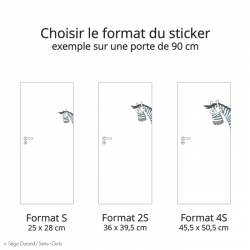 Here is a sticker that fits in any room of the house! With its pretty pink, red, blue, yellow and green leaves, you can decorate any wall you want. 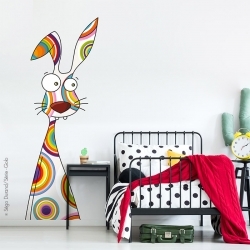 The Multicolored wall sticker is a little bit of colorful outside that comes inside! That's so cool! The beak of the pelican transforms into a giant swimming pool for our little fishes! They jump everywhere; that's a party! The pelican wall sticker is perfect for the deco of our little sailor's bedroom! All the little fishes in the water are beautiful! It's the Bubbles family sticker! With the little fishes on my bedroom wall, I can swim away towards my sweetest dreams! Lots of stuff is going on in the ladybugs house! All their friends are invited! A real little universe that flies happily in our kids bedroom. The Ladybugs house wall sticker will bring a colorful touch of good mood. With this sticker, music is everywhere in your children bedroom! A little guinguette air with the accordion, the trumpet and drums, a decoration full of happiness! A few musical notes of jazz and all your walls are waking up, but not too loud because the little koala is taking a nap ont the crocodile's tail. The sticker jazzy it's also lots of confetti to decorate the bedroom of your children. A little bit of softness, pretty flowers and cute birds. With the sticker flowering birds decorate your home with a touch of nature. The butterflies are flying toward adventure! A soft and colorful sticker with pretty flowers to cutomize your home. We are so happy! We love, we sing, we fly... the sticker after the rain, it's a rainbow of happiness on your walls. YAY! We have fun! Kiki the monkey and his buddy the elephant are throwing Confettis up in the air! The elephant looks good in his fancy suit! It's an explosion of happy mood and pretty colors in your bedroom...or anywhere you like! With the Party time! wall sticker. 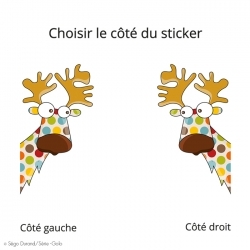 The sticker boogie woogie, it's a decoration full of rythm with this quator. Maracas, guitar, trombone and cymbals make you want dance all day long! An original deco for your little muscicians bedrooms. With this sticker for children concerto, you are the conductor for these happy musicians! The flamingo plays the violin, the harp for the mouse, the rabbit with the flute and the birds sing. Mmh the smell of freshly cut grass ! A little girl swinging in the tree and playing with pretty birds... Hello there tweet tweet birds, a wall sticker fresh and colorful like spring to decorate your children's bedrooms. These toucans are really funny! Perched on their liana with multicolored leaves, they swing gently. 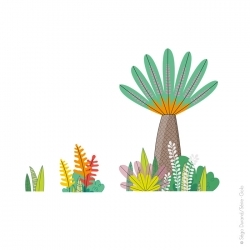 The Toucans wall sticker is a rainbow of happiness in the deco of little ones and grown-ups! Daddy koala and son are having a blast, while little sister is taking a nap. 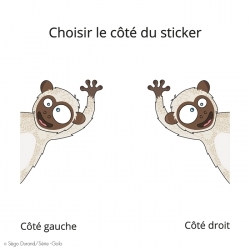 The sticker koalas, it's a deco full of nature and humor for the bedrooms of our little adventurers. Would you like to hang out in the field? The bear has invited his buddy the cat! All comfy, butts in the grass, they watch the butterflies and the snails wriggling! Even the little mouse has joined them secretly! The In the fields! 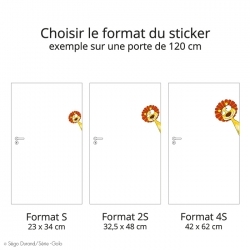 sticker brings a touch of tenderness in your home. In my bedroom, there is a magic tree...Look at all these colorful leaves! That's beautiful, isn't it? On its trunk, lots of multicolored patterns! The Highly colorful wall sticker is an amazing deco for all the nature lovers! In my bedroom, there is a magic tree...Look at all these colorful leaves! That's beautiful, isn't it? On its trunk, lots of multicolored dots! The Little Wood wall sticker is an amazing deco for all the nature lovers! On the Kiki's tricks sticker we are back with our funny little monkeys who are playing like crazy, once again! On their branch, they are making mischief and they crack us up! 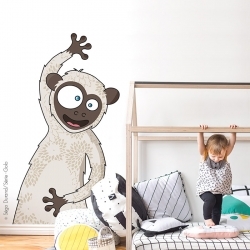 Serie-Golo wall stickers: a full range of stickers for every kid! Hanging on the liana, there is daddy monkey, mummy monkey and Kiki their baby! Kiki holds her mum tight and goes crazy! Ha, ha! I bet there are bananas for snack time! With the Kiki's family sticker on my bedroom wall, it's a life sized jungle! I'm growing up so fast! With my Tree wall ruler sticker, I can see that I am already taller than Kitty! I can't wait to reach the height as high as the little birds and to be able to wave at the owl that hides in her hole! This is the good way to grow and still have fun! Look at these foodies! Tom and Nina love apples and you can see it their baskands are full! The Apple picking sticker gives color to the bedroom of the little fruit pickers! 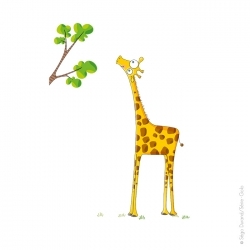 Mrs Giraffe is a foodie! With her long neck, she can reach up to the green leaves and eat them all! 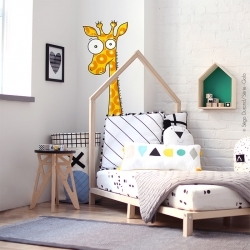 Here is a life sized deco for your bedroom...Mrs Giraffe is 2 meters long! The Giraffe baby boys are still babies. So cute, they are just learning to walk. It's funny to watch them sit down and try to stand up again. 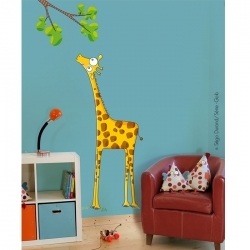 The Mister Giraffe baby boys sticker decorates the grown-ups room as well as the children s bedroom. The Hippo is so handsome with all its beautiful colors! 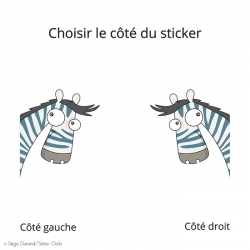 The Zebra and the Giraffe have jumped on his back! Hang on my friends ! Here we go on a ride! Are you on board birds? The Stroll with friends wall sticker guarantees a happy mood! Nice little monsters in my bedroom are getting crazy! They are so clever that they can lock up all the nightmares in the closet! Now you can have fun in the dark with the Monsters pyramid wall sticker! Yeah! Let's get in the camper van! Off for adventures with all my buddies: the moose, the dog, the giraffe, the cow, the cat and even the frog. Everyone's welcome! I love to travel with the Let's go sticker! Here is a magic tree! Each star that grows on it is a wish that will come true! With its soft colors, the Tree of stars sticker will light up your home! Listen up little musicians ! All your animal buddies are here to sing your favorite song! The cat plays guitar, the squirrel plays accordion, the ladybug is on the flute and the mouse is on the tambourine! And did you see the little worm that hides to listen in secret! In the bedroom, the sweet melody sticker lulls our little loved ones to sleep! Here are beautiful multicolored mushrooms! The mouse, the snail, the butterfly, the ladybug, the rabbit, the hedgehog and the little bird are ready for the show! In front of their curious eyes, a multitude of colored stars light up the sky. The Mushy-mushrooms wall sticker is a magical deco in your bedroom! Hi there little pilots! Get on board of the orange plane with our friends the zebra, the duck and the goat! Immediate take-off! Up around the clouds and the birds, the airplane wall sticker brings a bit of wonderness of the sky to your bedroom! Here we go, all friends get on board! In the bedroom, the Little sailors sticker is an ideal decor full of travels with your favorite animals: the moose, the duck, the zebra, the giraffe, the cat, the pig, the rabbit, the frog, the seagull and the fish. They are all together! It swings all around with Kiki the monkey, his little one and friends. Coming straight from the jungle, the It swings sticker is a large sized deco that will fill your kid's bedroom with colors and happiness! Is everyone ready? Open up your ears! Mister Owl's gonna tell a story! On the tree branch, the squirrels, birds, and ladybugs are getting impatient! It's story time in your bedroom with the Little reading sticker.